Please block your Calender dates now! 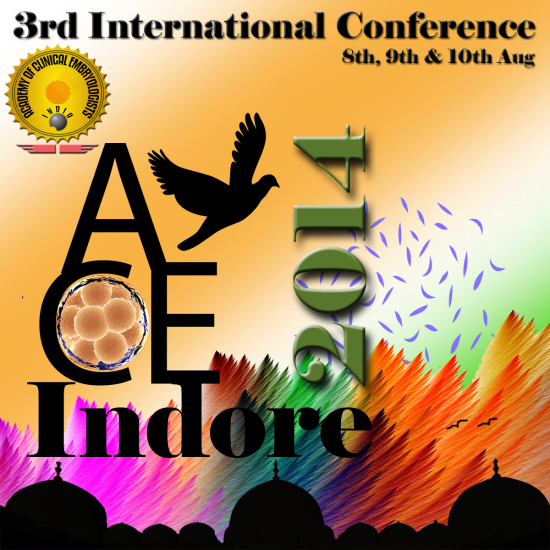 It gives me immense pleasure to invite all of you to the 3rd¬ International Conference of the Academy of Clinical Embryologists. Last two conferences have been huge success due to an overwhelming participation of IVF professionals from all over the country. I am sure with the galaxy of its national and international speakers and the high standard of the scientific content it is again going to be great scientific feast of latest developments and knowledge in the field of ART. Workshop on mechanics of micro manipulator: This unique workshop will mainly focus on mechanical aspects of micro manipulator which include alignment of pipettes, angle adjustments, maintenance and other related tips for getting effective performance by your manipulator. All three brands available in India that is RI (UK), Narishige (Japan) and Ependorff (Germany) will be displayed accompanied by company engineers and expert embryologists working with these machines. Workshop on Batch IVF: Majority of centers perform their ART cycles in batches. This workshop will address various issues related to batch IVF. 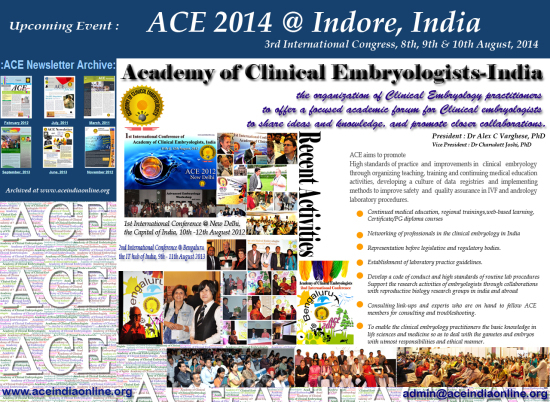 The practical difficulties faced by the IVF specialists will be discussed in detail. This will equally help both the clinicians as well as the embryologists. Work shop ON PGS/PGD (Pre natal genetic screening/ Pre natal genetic diagnosis): One to one interactive and actual hands on workshop conducted by the experts in the field. For limited participants only. Workshop on Vitrification: This is another unique workshop where latest techniques like multi thermal gradient system for Vitrification will be discussed with the pioneers of the field from Israel. Another major attraction would be a special session on uterine transplantation and pregnancy. There will be video presentations and lectures from its pioneers. Indore is a developing city situated in Central India. It is very well connected with major metro cities and rest of India by Railways, Bus, and Air. It has international airport with direct and stop over flights to all over India. Nearby, there are many places of tourist attraction. Lets have a feast of knowledge again !